Super heroes and vampires are fighting a secret war for control of the fabric of reality. Whoever acquires mastery of the reality shifting powers of the Metaframe will become the new gods of the universe. "Imagine if you could change the rules of the game, what rules would you choose? "Witness to a brutal murder, eighteen year old Anton Slayne is inducted by the mysterious Mr Wu into the secret society of vampire hunters, the Order of Thoth. He soon discovers that vicious local gangsters, determined Boston Police Detectives, and relentless Shadowstone operatives pale into insignificance as he is drawn into the machinations of the enigmatic supervillain, vampire General Chloe Armitage.Heir to a legacy of super powers, Anton joins a team of superheroes, but that is no guarantee of survival against the most powerful supervillains in the world, especially when they're equipped with the latest available technology and super weapons. "When mastery over your soul is at stake, survival is the least of your problems. ""Like Underworld on speed, it's got all the adrenaline and action-packing shots of entertainment you could want, wrapped up in a no-nonsense narrative." 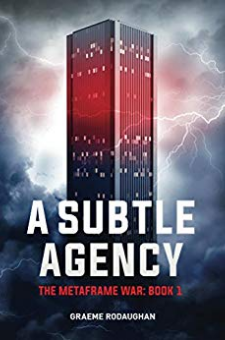 - Adam Smith, Cultured VulturesBe prepared to be blown away by a high-octane, dark fantasy, superhero action adventure thriller, that would be at home in a summer movie blockbuster.Join the heroes of the Metaframe War, buy A Subtle Agency now.